Last week I was in Taiwan — more on that to come — and thanks to jet lag, I only made it through half of the Oscars on Sunday night. I recorded the rest, but when I woke up at 4 a.m. the next day, Facebook spoiled me for the big awards. Ah well. I’m happy for all of the winners, but having now seen 4 out of the 8 Best Picture nominees, I do think Selma was snubbed in several categories, and I can’t for the life of me understand why. Yeah, it doesn’t make any sense. Sigh. Anyway, in the awards season spirit of honoring great storytelling, I just wanted to share my thoughts on the “Best Pictures” that I’ve seen this year. I actually mentioned this one earlier. Basically: it’s solid and well-made in every way, and I appreciated the historical context. 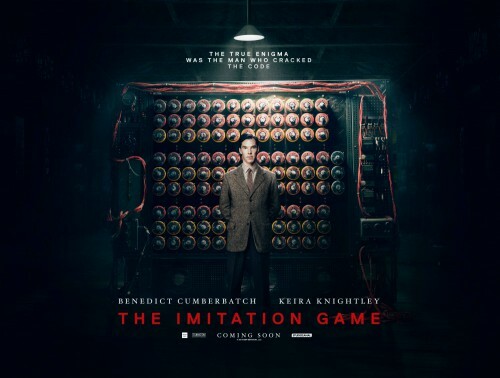 Benedict Cumberbatch does a good job differentiating Alan Turing’s social obliviousness and vulnerability from the social indifference and snobbery of Sherlock Holmes. I never quite forgot that Keira Knightley was Keira Knightley, but she portrayed Joan Clarke well nevertheless. Matthew Goode was both excellent and dashing. Why is he not in more things? Caught this one on cable. I find Wes Anderson to be interesting but a bit overrated, and Grand Budapest Hotel did nothing to change that impression for me. The movie is amazingly crafted, every detail impeccably styled. But for all its prettiness, the story seemed a bit pointless to me. It’s a bromance, I guess? And it makes some sort of commentary on an old-fashioned sense of honor and doing things the “right” way? I dunno. The plot and themes seemed to be afterthoughts, simply there to justify the aesthetic. I was afraid Selma would be out of theaters by the time I got back from Taiwan, so between errands and packing, I squeezed in a weekday matinee. 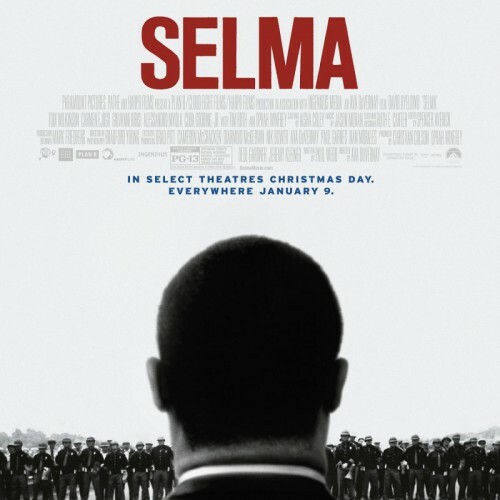 Selma was, in a word, powerful. David Oyelowo deftly carried the weight of Martin Luther King, Jr.’s legacy, but he was also supported by a superb cast. In particular, Carmen Ejogo shone, along with Stephan James as the young civil rights activist and future congressman John Lewis, and Keith Jackson (from Short Term 12) in the heartbreaking role of Jimmie Lee Jackson. At this point I would say that Dr. King is known for his idealism and inspiring speeches, but I loved seeing the strategic side of his movement too — as well as having that balanced out by people who didn’t fully support him, and understanding why. 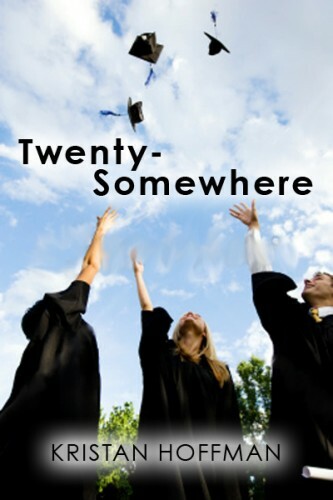 In addition to being moved to tears many, many times, I felt liked I learned. No citizen of this country can call themselves blameless for we all bear a responsibility for our fellow man. Andy and I watched this one together on the flight from Minneapolis to Tokyo. Thank you, Delta in-flight entertainment system. The production of this film is a fascinating story all on its own. Filmed during one month of every year for 12 years, with an overall arc in place ahead of time, but with specific scenes being written each year based on how the lead actor has grown and on what had come before. A unique and ambitious project, for sure. I liked the idea of following a character through such a formative period in his life — and there was definitely something special about it being one young actor growing up before our eyes, as opposed to casting multiple actors to play the same character at various ages. In some ways, nothing really happens. There isn’t some big plot to follow. It’s just life. 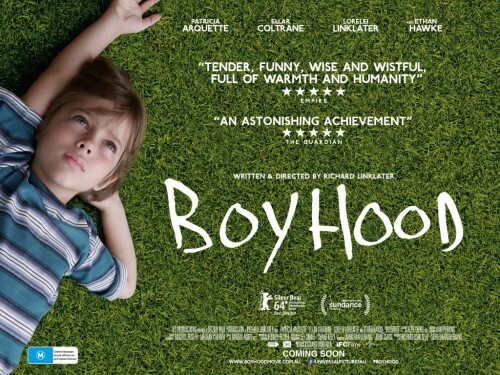 But in spite of that — or maybe because of it — Boyhood is strangely compelling. Also, Patricia Arquette and Ethan Hawke are both outstanding. Last year’s Best Picture winner. Better late than never. I watched this one by myself, on the flight from Tokyo to Detroit. At first I didn’t enjoy how the beginning jumped around in time, but then I thought about the way it reflected Solomon Northrup’s longing for home, and his precious memories of his family and freedom, and I decided it was a good device. All of the performances were pretty stellar, especially Lupita Nyong’o. Brad Pitt and Benedict Cumberbatch might actually have been the weak spots, which is both unusual and not that bad of a problem to have. Chiwetel Ejiofor was his usual awesome, understated self, and Michael Fassbender (who I will no longer call my Hollywood Boyfriend, because I’ve outgrown that phase) was his usual creepy, unhinged self. I’m not sure what it says about him that he always takes these roles, or that he always does them so well… Hopefully nothing! I actually watched several other movies and TV shows traveling to and from Taiwan (36 hours each way!) so you may be reading more about them in the near future. Right now, though, I have a manuscript to get back to. And jet lag to combat. And a million loads of laundry to tackle. 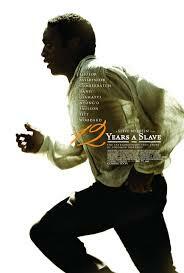 Twelve Years a Slave, I still need to watch that one–and you’ve given me a few to add to the list. The hubby and I have fallen away from movie watching in recent years, maybe because we’ve got little eyes and ears hanging around. Regardless, I enjoyed your thoughts on these films. LOL glad to know I wasn’t the only one! I still really admire him as an actor, but I’m just over crushing on Hollywood guys, I guess. Sorry, Fassbender, Gosling, and Tatum! I can’t wait to hear about Taiwan! As far as these movies, only 12 Years a Slave and Boyhood interested me. 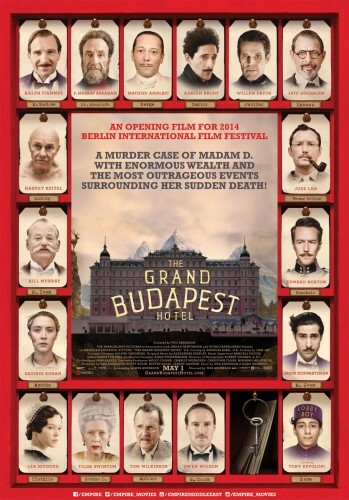 I HATED Grand Budapest Hotel and turned it off after 20 minutes. I just didn’t care about any of the characters, or the storyline, at all. 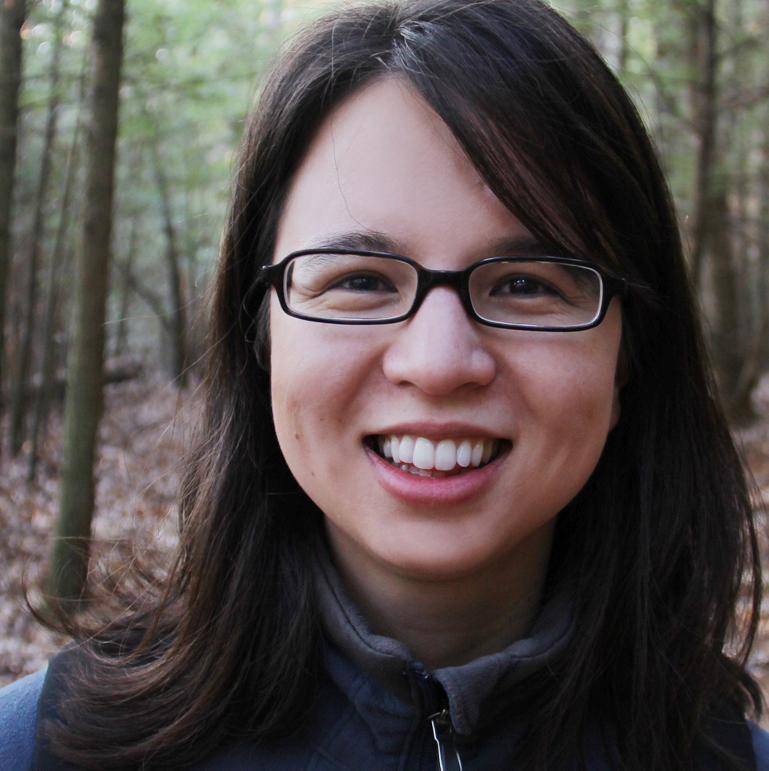 Good reminder to us as writers — we must connect with our audience! I think you would really enjoy Taiwan if you ever get the chance to go! I now only watch movies that don’t actually require me to think. And yet, Guardians of the Galaxy won nothing. What a terrible oversight. Did you reorganize your webpage? Or is my computer randomly moving things around to see if I notice? LOL I would love to mess with you and say the latter, but no, I’m reorganizing. These are baby steps in the direction of a larger redesign.